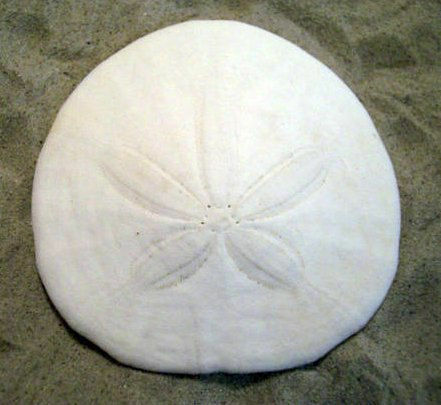 A sand dollar shell looks sort of like a round white coin, which is where it gets its name. When you see a sand dollar that’s washed up on the beach, it usually appears to be a round, white circular disk, typically one inch to four inches in diameter. When they’re alilve they’re actually a dark color, covered with short dark spines that look almost like fur. These spines are moveable, and the sand dollar uses them both to move around on sea bottom and to push small pieces of food to its mouth. Just as the common sea star or starfish has five arms, most sand dollars have a pattern of five sets of pores on them. Those are used to move sea water into the sand dollar’s body, which is then pumped to where it’s needed to aid in movement or other internal functions. Sand dollars like smooth sandy or muddy ocean bottoms. They mainly live in shallow water, near land. Sand dollars reproduce by releasing eggs and sperm into the water, where they join and develop into free-swimming larvae. These develop through several steps until the hard skeleton starts to form. Then they drop to the bottom and live the rest of their lives there. If the water is fairly calm where they live they will often stand on edge, partly in the mud and partly exposed to the clear water. If they live in an area with strong currents, sand dollars can hold their position by burrowing into the soft bottom. They will also swallow sand grains to build up their weight so they don’t get washed away! If you find a sand dollar skeleton on the beach (looking at low tide is best), and it’s white (so you know it’s not still alive), and the rules for that beach say it’s O.K. to take it, then you may. But be aware that it needs to be treated very carefully to be preserved.